A rendering of the City’s proposal for the rail deck park. Rendering courtesy of the City of Toronto. City Hall was packed Monday night as hundreds crammed in to council chambers to hear about a proposed 21-acre park in the downtown core. The session followed an open meeting outlining the private development application for the area held a few weeks earlier, on September 12. There are now two distinct visions for what to do with the rail corridor. But even after the two standing-room-only meetings, there is little clarity around which plan will ultimately prevail—and who will foot the bill for the development of downtown Toronto’s largest remaining undeveloped space. The region in question—south of King Street, east of Bathurst Street, west of University Street, and north from the waterfront—has experienced tremendous growth in the last 20 years, with some estimates suggesting a doubling of the population to half a million residents within the next 25 years. 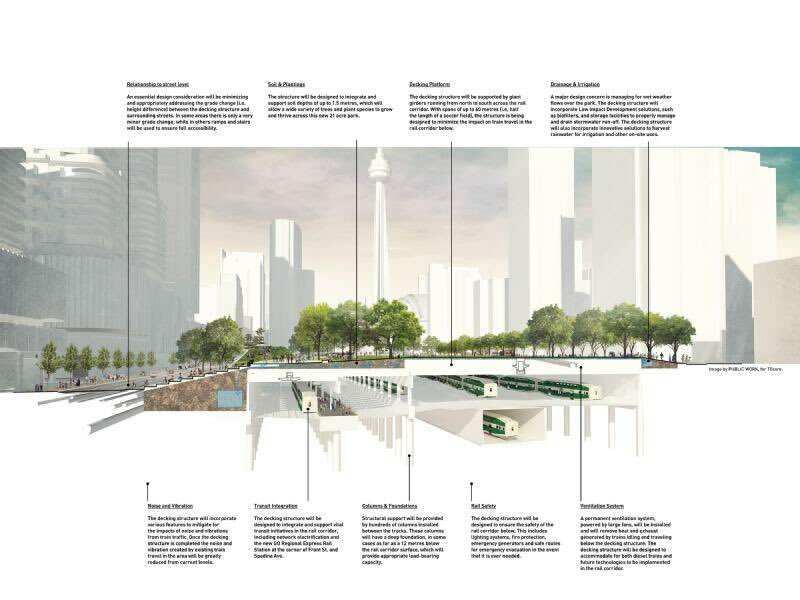 The City’s plan would help provide a more substantial connection between the downtown core and the waterfront, and bring much-needed green space “in the most parks-deficient area in all of Toronto,” according to the plan’s strongest municipal advocate, Joe Cressy (Ward 20, Trinity-Spadina). The private development application also calls for the development of a substantial green space within the rail corridor, but would utilize a significant portion of the acreage for the construction of residential and mixed-use buildings. “At least half of the area will be for public, open space,” according to director of planning for R.E. Millward and Associates, Ian Graham, who fielded dozens of questions about the private development application from residents at the September 12 meeting. “It is not a private park, it is a public park, and it’s always been a major component to the proposal. The status of the private application is still currently under review, according to City of Toronto senior planner Susan McAlpine, who said there are a number of issues identified that have given City staff significant concerns with the proposal. “The development would be significantly higher than the streets and neighbourhoods surrounding it—as much as 10 metres above the existing grade, which we feel is inconsistent with good design principles,” said McAlpine at the September 12 meeting. Two important details remained unclear following the City’s proposal on September 15 however, including ownership of the air rights above the rail corridor and where the funding would come from to foot the bill for the likely $1-billion-plus project. A cross-section rendering of the proposed park, courtesy of the City of Toronto. “The City owns some of the [air rights], they are also owned by certain private interests, third-party groups, and some of them are owned by Metrolinx and the railways,” according to Lynda Macdonald, acting director of community planning for Toronto and East York. 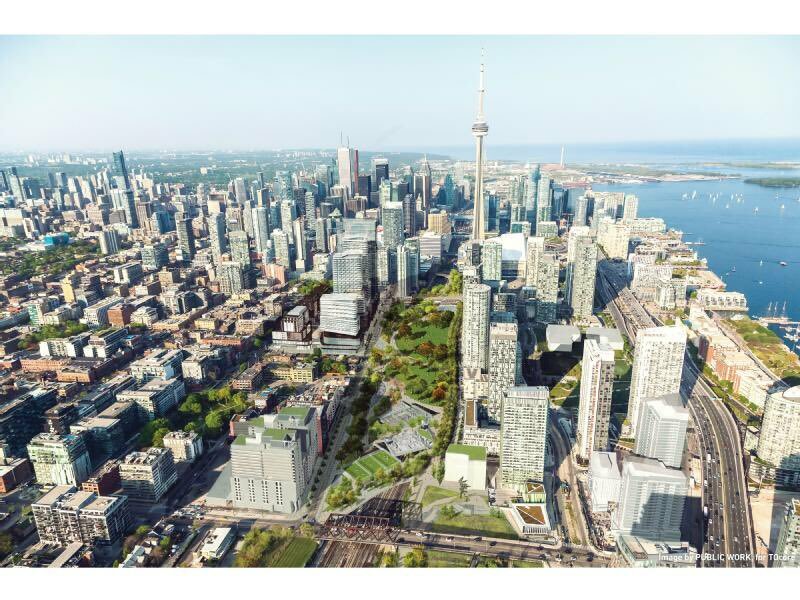 Cressy, who has had the backing of Mayor John Tory for the project since the announcement of the City’s proposal in late August, remained confident that City Council would ultimately endorse Rail Deck Park over the private proposal. According to Cressy, the City has already accumulated hundreds of millions of dollars in parkland acquisition funds that have not been spent. “We have parkland funds that can only be spent to buy parkland, so it’s not an either-or proposition,” said Cressy. “The other thing I would say—and this speaks to some of the skepticism I hear when people say how we can build it, do we have the money—you get the City you pay for. If we as Torontonians want to live in a great livable city, then for goodness sake pay for it and build it. More details about the City’s proposal, including financing, will be tabled at a meeting in November.